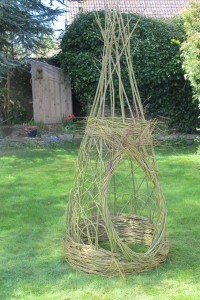 A willow bower for the Byre Theatre. I have just completed a willow bower that will be used as a prop at the Byre Theatre in St. Andrews. The design was based on bowers made for the “Snowdrops by Starlight” event at Cambo Estate where they were used as play houses for children. However this one was commissioned to hold a Pagan Idol for a play by Gluck on the 17 & 18th of June. They are great as play houses in the garden and being quite small and light can be moved around easily. They are available to order, get in touch if you would like one ! Previous PostMaking Traditional English Wooden Eating Spoons.Next PostWhirlygigs and whimmy diddles, some new work for Open Studios.